What is device rotation behavior? Device rotation behavior refers to when a user rotates their tablet or mobile device, from portrait to landscape mode or vice versa. This behavior can reflect either engagement or frustration. If viewing a video, for example, it is commonplace to rotate your device into landscape mode for a better viewing experience. This signifies engagement. On occasions where there are multiple rotations in a short space of time, however, this suggests that a website or app’s responsive design is not performing optimally for the user, resulting in this see-saw between portrait and landscape. Why is device rotation behavior important? Being alerted to and keeping an eye on device rotation behavior is a shrewd move – especially for conversion-critical parts of your website, like ecommerce checkouts. Too often, while checking out on mobile, a large, well-meaning pop up for free shipping will totally cover the screen, rendering a user unable to complete their purchase. Despite their frantic, desperate rotations, the pop up will not budge, and there’s no way to close it. A sale lost. 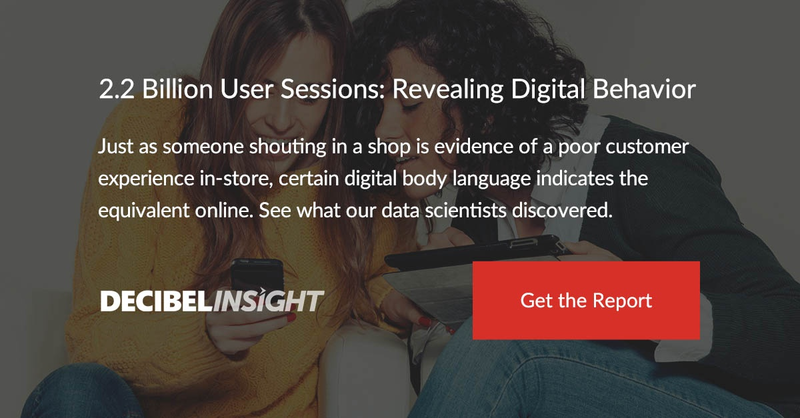 To learn more about device rotation behavior - and other digital behaviors that denote user sentiment - download our full report on digital body language below.